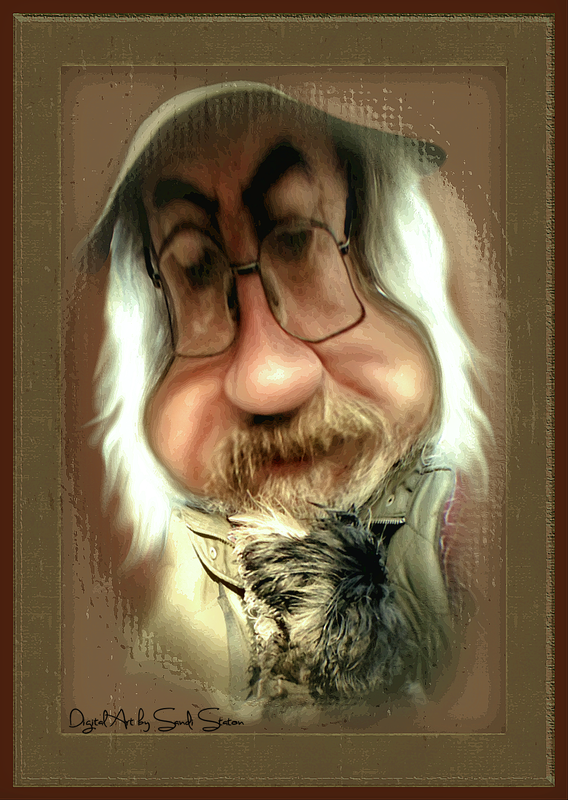 My blogger friend, Colin, atrampinthewoods.wordpress.com, gave me permission to do caricatures of him and Fizz. Caricatures offend some people, so I always ask permission first. Caricatures are meant to be fun, not to make fun of. I would never make fun of anyone; I know how badly it hurts. So many thanks to Colin and Fizz for being such great sports! Fizz wanted to go first, so here she is. Creating digital caricatures takes a lot of practice. If you warp the photo too much, you have a ridiculous looking mess. Fizz was difficult. She’s the first animal I did a caricature of. She was very patient though, sitting through hours of being deleted and reshaped and moved from scene to scene. Even after all that, I still was not pleased with her look. She got too fuzzy, so I added texture to compensate for that. I like crisp and clean for my caricatures. Although Fizz didn’t turn out that way I had intended, she’s still adorable. Thanks Fizz! Sorry Fizz, but Colin was so much easier to work with. Not that I’ve given up on you, it’s just that people have less hair than dogs. Do they have cowboys in the UK? Well they do now. I think Colin makes a great-looking cowboy. Can’t you see him in a pair of leather chaps, spurs on his boots, and racing a sleek black stallion through the Forest of Dean? Sorry, Colin. I get carried away sometimes. At least I didn’t envision you wearing a cape and mask too. Or did I? Well that’s all I have for today. I spend way too much time at the computer. Yesterday I finally got geared up and actually washed two loads of laundry and blew off the dust piled sky high on my furniture. I even washed the dishes! I might even clean my bathroom today . . . or not. Thanks everyone for looking at my stuff. If you like it, please let me know by clicking the little LIKE button. And leaving a word of encouragement is always appreciated. Thanks!